Formaldehyde is a naturally-occurring organic compound with the formula CH2O (H-CHO). It is the simplest of the aldehydes (R-CHO) and is also known by its systematic name methanal. The common name of this substance comes from its similarity and relation to formic acid. When dissolved in water, formaldehyde also forms a hydrate, methanediol, with the formula H2C(OH)2. 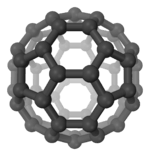 This compound also exists in equilibrium with various oligomers (short polymers), depending on the concentration and temperature. 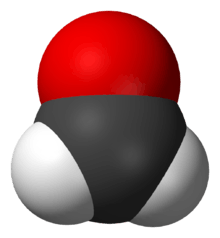 A saturated water solution, of about 40% formaldehyde by volume or 37% by mass, is called "100% formalin". A small amount of stabilizer, such as methanol, is usually added to suppress oxidation and polymerization. A typical commercial grade formalin may contain 10–12% methanol in addition to various metallic impurities. The name was long ago genericized from an old trade name "Formalin". Formaldehyde and its adducts are ubiquitous in living organisms. It is formed in the metabolism of endogenous amino acids and is found in the bloodstream of humans and other primates at concentrations of approximately 0.1 millimolar. Experiments in which animals are exposed to an atmosphere containing isotopically labeled formaldehyde have demonstrated that even in deliberately exposed animals, the majority of formaldehyde-DNA adducts found in non-respiratory tissues are derived from endogenously produced formaldehyde. Formaldehyde does not accumulate in the environment, because it is broken down within a few hours by sunlight or by bacteria present in soil or water. Humans metabolize formaldehyde quickly, so it does not accumulate, converting it to formic acid in the body. Formaldehyde appears to be a useful probe for astrochemists due to its low reactivity in the gas phase and to the fact that the 110←111 and 211←212 K-doublet transitions are rather clear. Formaldehyde is a building block in the synthesis of many other compounds of specialised and industrial significance. It exhibits most of the chemical properties of other aldehydes but is more reactive. For example, it is more readily oxidized by atmospheric oxygen into formic acid (formic acid is found in ppm levels in commercial formaldehyde). Formaldehyde is a good electrophile, participating in electrophilic aromatic substitution reactions with aromatic compounds, and can undergo electrophilic addition reactions with alkenes and aromatics. Formaldehyde undergoes a Cannizzaro reaction in the presence of basic catalysts to produce formic acid and methanol. Condensation with acetaldehyde affords pentaerythritol, a chemical necessary in synthesizing PETN, a high explosive. Condensation with phenols gives phenol-formaldehyde resins. With 4-substituted phenols one obtains calixarenes. When combined with hydrogen sulfide, it forms trithiane. Formaldehyde can be reduced to methylamine via reductive amination. Methylamine can then be used in other synthetic processes using reductive amination to yield secondary amines. It is first reacted with ammonia to form an imine and water. Then this is reduced using LiAlH4 via an Sn2 reaction or by catalytic hydrogenation to produce the amine. Formaldehyde is also a precursor to polyfunctional alcohols such as pentaerythritol, which is used to make paints and explosives. Other formaldehyde derivatives include methylene diphenyl diisocyanate, an important component in polyurethane paints and foams, and hexamine, which is used in phenol-formaldehyde resins as well as the explosive RDX. Formaldehyde has been found as a contaminant in several bath products, at levels from 54–610 ppm: it is thought to arise from the breakdown of preservatives in the products, most frequently diazolidinyl urea. Since 2006, formaldehyde (methylene glycol) is also used in hair smoothing treatments in order to straighten wavy/curly hair and make hair less prone to frizz under high humid weather. OSHA Oregon has reported these treatments as unsafe for human health. An aqueous solution of formaldehyde can be useful as a disinfectant as it kills most bacteria and fungi (including their spores). Formaldehyde solutions are applied topically in medicine to dry the skin, such as in the treatment of warts. Many aquarists use formaldehyde as a treatment for the parasites Ichthyophthirius multifiliis and Cryptocaryon irritans. Formaldehyde is used to inactivate bacterial products for toxoid vaccines (vaccines that use an inactive bacterial toxin to produce immunity). It is also used to kill unwanted viruses and bacteria that might contaminate the vaccine during production. Urinary tract infections are also often treated using a derivative of formaldehyde (methenamine), a method often chosen because it prevents overuse of antibiotics and the resultant development of bacterial resistance to them. In an acid environment, methenamine is converted in the kidneys to formaldehyde, which then has an antibacterial effect in the urinary tract. Some topical creams, cosmetics, and personal hygiene products contain derivatives of formaldehyde as the active ingredients that prevent the growth of potentially harmful bacteria. Formaldehyde preserves or fixes tissue or cells by a mixture of reversible (short exposure time and low temperatures) and irreversible (long exposure time and higher temperatures) cross-linking of primary amino groups in proteins with other nearby nitrogen atoms in protein or DNA through a -CH2- linkage. This is exploited in ChIP-on-chip or ChIP-sequencing genomics experiments, where DNA-binding proteins are cross-linked to their cognate binding sites on the chromosome and analyzed to determine what genes are regulated by the proteins. Formaldehyde is also used as a denaturing agent in RNA gel electrophoresis, preventing RNA from forming secondary structures. A solution of 4% formaldehyde fixes pathology tissue specimens at about one mm per hour at room temperature. Formaldehyde solutions are used as a fixative for microscopy and histology because of formaldehyde's ability to perform the Mannich reaction, although the percentage formaldehyde used may vary based on the method of analysis. Additionally, the methanol used to stabilize formaldehyde may interfere with the ability to properly fix tissue or cells, and therefore commercial formaldehyde preparations are available that are packaged in glass ampules under an inert gas to prevent the use of contaminating methanol for stabilization. Formaldehyde-based solutions are also used in embalming to disinfect and temporarily preserve human and animal remains. It is the ability of formaldehyde to fix the tissue that produces the tell-tale firmness of flesh in an embalmed body. 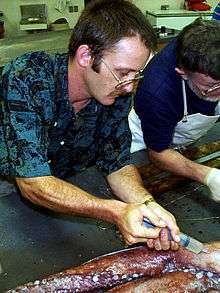 In post mortem examinations a procedure known as the "sink test" involves placing the lungs of an animal in an aqueous solution of formaldehyde; if the lungs float it suggests the animal was probably breathing or able to breathe at the time of death. Although formaldehyde solutions are commonly used as a biological preserving medium, usually for smaller specimens, it delays, but does not prevent, decay. This method of fixation does not preserve nucleic acids, thus preventing, for example, genetic analysis of the first discovered Dendrogramma specimens. Several European countries restrict the use of formaldehyde, including the import of formaldehyde-treated products and embalming. Starting September 2007, the European Union banned the use of formaldehyde due to its carcinogenic properties as a biocide (including embalming) under the Biocidal Products Directive (98/8/EC). Countries with a strong tradition of embalming corpses, such as Ireland and other colder-weather countries, have raised concerns. Despite reports to the contrary, no decision on the inclusion of formaldehyde on Annex I of the Biocidal Products Directive for product-type 22 (embalming and taxidermist fluids) had been made as of September 2009. Formaldehyde, along with 18 M (concentrated) sulfuric acid makes Marquis reagent which can be used to identify alkaloids and other compounds. Formaldehyde is highly toxic to all animals, regardless of method of intake. Ingestion of 30 mL (1 oz.) of a solution containing 37% formaldehyde has been reported to cause death in an adult human. Water solution of formaldehyde is very corrosive and its ingestion can cause severe injury to the upper gastrointestinal tract. In the residential environment, formaldehyde exposure comes from a number of different routes; formaldehyde can off-gas from wood products, such as plywood or particle board, but it is produced by paints, varnishes, floor finishes, and cigarette smoking as well. In July 2016, the EPA released a prepublication version of its final rule on Formaldehyde Emission Standards for Composite Wood Products. These new rules will impact manufacturers, importers, distributors, and retailers of products containing composite wood, including fiberboard, particleboard and various laminated products, who will need to comply with more stringent record-keeping and labeling requirements. In June 2011, the twelfth edition of the National Toxicology Program (NTP) Report on Carcinogens (RoC) changed the listing status of formaldehyde from "reasonably anticipated to be a human carcinogen" to "known to be a human carcinogen". Concurrently, a National Academy of Sciences (NAS) committee was convened and issued an independent review of the draft United States Environmental Protection Agency IRIS assessment of formaldehyde, providing a comprehensive health effects assessment and quantitative estimates of human risks of adverse effects. There are several web articles claiming that formaldehyde has been banned from manufacture or import into the European Union (EU) under REACH (Registration, Evaluation, Authorization, and restriction of Chemical substances) legislation. This appears to be misinformation, as official EU chemical databases contradict these claims as of February 19, 2010. This misconception has gained some ground. Formaldehyde is not listed in the Annex I of Regulation (EC) No 689/2008 (export and import of dangerous chemicals regulation), nor on a priority list for risk assessment. However, formaldehyde is banned from use in certain applications (preservatives for liquid-cooling and processing systems, slimicides, metalworking-fluid preservatives, and antifouling products) under the Biocidal Products Directive. In the EU, the maximum allowed concentration of formaldehyde in finished products is 0.2%, and any product that exceeds 0.05% has to include a warning that the product contains formaldehyde. In the United States, a bill was passed in Congress on July 7, 2010, regarding the use of formaldehyde in hardwood plywood, particle board, and medium density fiberboard. The bill limited the allowable amount of formaldehyde emissions from these wood products to .09 ppm, a standard which companies were required to meet by January 2013. Formaldehyde was declared a toxic substance by the 1999 Canadian Environmental Protection Act. Scandals have broken in both the 2005 Indonesia food scare and 2007 Vietnam food scare regarding the addition of formaldehyde to foods to extend shelf life. In 2011, after a four-year absence, Indonesian authorities found foods with formaldehyde being sold in markets in a number of regions across the country. Besides using formaldehyde, they also used borax, but not in combination. In August 2011, at least at two Carrefour supermarkets, the Central Jakarta Livestock and Fishery Sub-Department found a sweet glutinous rice drink (cendol) contained 10 parts per million of formaldehyde. In 2014, the owner of two noodle factories in Bogor, Indonesia; was arrested for using formaldehyde in noodles. 50 kg of formaldehyde was confiscated. Foods known to be contaminated include noodles, salted fish, and tofu; chicken and beer are also rumored to be contaminated. In some places, such as China, formaldehyde is still used illegally as a preservative in foods, which exposes people to formaldehyde ingestion. In humans, the ingestion of formaldehyde has been shown to cause vomiting, abdominal pain, dizziness, and in extreme cases can cause death. Testing for formaldehyde is by blood and/or urine by gas chromatography-mass spectrometry. Other methods include infrared detection, gas detector tubes, etc., of which HPLC is the most sensitive. In the early 1900s, it was frequently added by US milk plants to milk bottles as a method of pasteurization due to the lack of knowledge regarding formaldehyde's toxicity. In 2011 in Nakhon Ratchasima, Thailand, truckloads of rotten chicken were exposed to formaldehyde in which "a large network," including 11 slaughterhouses run by a criminal gang, were implicated. In 2012, 1 billion rupiah (almost USD100,000) of fish imported from Pakistan to Batam, Indonesia, were found laced with formaldehyde. Formalin use in foods is a crucial problem in Bangladesh currently. Local stores and supermarkets often sell fruits, fishes, and vegetables that have been treated with formalin to keep them fresh. However, in 2015, a Formalin Control Bill was passed in the Parliament of Bangladesh with a provision of life-term imprisonment as the maximum punishment and in addition 2,000,000 BDT as fine but not less than 500,000 BDT for importing, production or hoarding of formalin without license. 1 2 Nomenclature of Organic Chemistry : IUPAC Recommendations and Preferred Names 2013 (Blue Book). Cambridge: The Royal Society of Chemistry. 2014. p. 908. doi:10.1039/9781849733069-FP001. ISBN 978-0-85404-182-4. 1 2 3 4 "NIOSH Pocket Guide to Chemical Hazards #0293". National Institute for Occupational Safety and Health (NIOSH). 1 2 "Formaldehyde". Immediately Dangerous to Life and Health. National Institute for Occupational Safety and Health (NIOSH). 1 2 Harris, Gardiner (10 June 2011). "Government Says 2 Common Materials Pose Risk of Cancer". New York Times. Retrieved 2011-06-11. 1 2 National Toxicology Program (10 June 2011). "12th Report on Carcinogens". National Toxicology Program. Retrieved 2011-06-11. 1 2 National Toxicology Program (10 June 2011). "Report On Carcinogens – Twelfth Edition – 2011" (PDF). National Toxicology Program. Retrieved 2011-06-11. ↑ Mangum, Jeffrey G.; Darling, Jeremy; Menten, Karl M.; Henkel, Christian (2008). "Formaldehyde Densitometry of Starburst Galaxies". Astrophys. J. 673 (2): 832–46. arXiv:0710.2115 . Bibcode:2008ApJ...673..832M. doi:10.1086/524354. ↑ Cordiner, M.A. ; et al. (11 August 2014). "Mapping the Release of Volatiles in the Inner Comae of Comets C/2012 F6 (Lemmon) and C/2012 S1 (ISON) Using the Atacama Large Millimeter/Submillimeter Array". The Astrophysical Journal. 792 (1): L2. Bibcode:2014ApJ...792L...2C. doi:10.1088/2041-8205/792/1/L2. Retrieved 12 August 2014. ↑ "Formaldehyde in Clothing and Textiles FactSheet". NICNAS. Australian National Industrial Chemicals Notification and Assessment Scheme. May 2013. Retrieved 12 November 2014. ↑ "No More Toxic Tub: Getting Contaminants Out Of Children's Bath & Personal Care Products" (PDF). Campaign for Safe Cosmetics. March 2009. Retrieved 19 May 2012. ↑ Francis-Floyd, Ruth (April 1996). "Use of Formalin to Control Fish Parasites". Institute of Food and Agricultural Sciences, University of Florida. Archived from the original on May 27, 2012. ↑ Patel, Alkesh (2007-07-04). "Formaldehyde Ban set for 22 September 2007". WebWire. Retrieved 19 May 2012. ↑ "European chemical Substances Information System (ESIS) entry for formaldehyde". Retrieved 2009-09-01. ↑ "Process C-41 Using Kodak Flexicolor Chemicals – Publication Z-131". Kodak. Retrieved 2009-09-01. ↑ "Medical Management Guidelines for Formaldehyde". ↑ "Indoor Air Pollution in California" (PDF). Air Resources Board, California Environmental Protection Agency. July 2005. pp. 65–70. Retrieved 19 May 2012. ↑ "Formaldehyde". Occupational Safety and Health Administration. August 2008. Retrieved 2009-09-01. ↑ "Formaldehyde Reference Exposure Levels" (PDF). California Office Of Health Hazard Assessment. December 2008. Retrieved 19 May 2012. ↑ Formaldehyde and Indoor Air. Health Canada. August 2005. ISBN 0-8155-1129-9. Retrieved 2009-09-01. ↑ Broder, I; Corey, P; Brasher, P; Lipa, M; Cole, P (1991). "Formaldehyde exposure and health status in households". Environmental Health Perspectives. 95: 101–4. doi:10.1289/ehp.9195101. PMC 1568408 . PMID 1821362. ↑ McGwin, G; Lienert, J; Kennedy, JI (November 2009). "Formaldehyde Exposure and Asthma in Children: A Systematic Review". Environmental Health Perspectives. Environmental Health Perspectives. 118 (3): 313–7. doi:10.1289/ehp.0901143. PMC 2854756 . PMID 20064771. 1 2 "Formaldehyde and Cancer Risk". ↑ Zhang, Luoping; Steinmaus, Craig; Eastmond, Eastmond; Xin, Xin; Smith, Smith (March–June 2009). "Formaldehyde exposure and leukemia: A new meta-analysis and potential mechanisms" (PDF). Mutation Research/Reviews in Mutation Research. Mutation Research/Reviews in Mutation Research. 681 (2–3): 150–168. doi:10.1016/j.mrrev.2008.07.002. PMID 18674636. Retrieved 2013-05-22. ↑ "Formaldehyde and Leukemia: Epidemiology, Potential Mechanisms, and Implications for Risk Assessment". Environmental and Molecular Mutagenesis. Environmental and Molecular Mutagenesis. 51: 181–191. 2010. doi:10.1002/em.20534. ↑ "What are the key statistics about nasopharyngeal cancer?". ↑ Turner JH, Reh DD (June 2012). "Incidence and survival in patients with sinonasal cancer: a historical analysis of population-based data". Head Neck. 34 (6): 877–85. doi:10.1002/hed.21830. PMID 22127982. ↑ "What are the key statistics about chronic myeloid leukemia?". ↑ "What are the key statistics about acute myeloid leukemia?". 1 2 "What are the risk factors for nasopharyngeal cancer?". ↑ Butticè, Claudio (2015). "Solvents". In Colditz, Graham A. The SAGE Encyclopedia of Cancer and Society (Second ed.). Thousand Oaks: SAGE Publications, Inc. pp. 1089–1091. doi:10.4135/9781483345758.n530. ISBN 9781483345734. ↑ "What are the risk factors for acute myeloid leukemia?". ↑ "What are the risk factors for chronic myeloid leukemia?". ↑ Dales, R; Liu, L; Wheeler, AJ; Gilbert, NL (July 2008). "Quality of indoor residential air and health". Canadian Medical Association Journal. Canadian Medical Association Journal. 179 (2): 147–52. doi:10.1503/cmaj.070359. PMC 2443227 . PMID 18625986. ↑ Passmore, Whitney; Sullivan, Michael J. (August 4, 2016). "EPA Issues Final Rule on Formaldehyde Emission Standards for Composite Wood Products". The National Law Review. Womble Carlyle Sandridge & Rice, PLLC. Retrieved August 24, 2016 – via Google News. ↑ "Testing for Indoor Air Quality, Baseline IAQ, and Materials". Environmental Protection Agency. Archived from the original on October 15, 2006. ↑ Evans, Ben (2008-04-11). "FEMA limits formaldehyde in trailers". Boston.com. Archived from the original on June 15, 2010. Retrieved 2008-09-04. ↑ "Formaldehyde allergy". DermNet NZ. New Zealand Dermatological Society. June 2009. Retrieved 2009-09-01. 1 2 De Groot, Anton C; Flyvholm, Mari-Ann; Lensen, Gerda; Menné, Torkil; Coenraads, Pieter-Jan (2009). "Formaldehyde-releasers: relationship to formaldehyde contact allergy. Contact allergy to formaldehyde and inventory of formaldehyde-releasers". Contact Dermatitis. 61 (2): 63–85. doi:10.1111/j.1600-0536.2009.01582.x. PMID 19706047. ↑ Formaldehyde and Facts About Health Effects (PDF). Formaldehyde Epidemiology, Toxicology and Environmental Group. August 2002. Accessed on April 25, 2010. ↑ "European Union Bans formaldehyde/formalin within Europe" (PDF). European Commission's Environment Directorate-General. September 2007. pp. 1–3. Retrieved 19 May 2012. ↑ "ESIS (European Chemical Substances Information System)". European Commission Joint Research Centre Institute for Health and Consumer Protection. February 2009. Retrieved 19 May 2012. ↑ "S.1660 – Formaldehyde Standards for Composite Wood Products Act". OpenCongress. July 2010. Retrieved 19 May 2012. ↑ "Health Canada – Proposed residential indoor air quality guidelines for formaldehyde". Health Canada. April 2007. ↑ Mike Brunker (2006-07-25). "Are FEMA trailers 'toxic tin cans'?". MSNBC. Retrieved 19 May 2012. ↑ Kunzelman, Michael (2007-08-08). "Suit Filed Over FEMA Trailer Toxins". The Washington Post. Retrieved 2010-05-02. ↑ Brunker, Mike (September 28, 2012). "Class-action suit against FEMA trailer manufacturers settled for $42.6 million". NBC News. Retrieved 11 September 2015. ↑ Megan Terlecky (2008-10-24). "How We Tested for Formaldehyde". KGAN-TV. Archived from the original on June 15, 2011. ↑ "FEMA Trailers in Iowa Exceed Formaldehyde Levels Considered Safe". Insurance Journal. October 23, 2008. Retrieved 16 September 2015. ↑ Nigel Duara (2008-10-21). "FEMA disputes formaldehyde study of Iowa trailers". Associated Press. Archived from the original on October 31, 2008. ↑ Cindy Hadish (2008-10-24). "FEMA meets with mobile home residents over health concerns". Cedar Rapids Gazette. Archived from the original on February 22, 2009. ↑ "Formaldehyde-laced foods reemerge in Indonesian markets". August 10, 2011. ↑ "Formaldehyde-Tainted Rice Drinks Found at Carrefour Markets". August 22, 2011. ↑ "BPOM Uncovers Two Formaldehyde-Tainted Noodle Factories in Bogor". October 12, 2014. ↑ Xiaojiang Tang et al., "Formaldehyde in China: Production, consumption, exposure levels, and health effects (PDF)", Environment International 35 (2009): 1215–16, and other references cited on p. 1216; see also "Municipality sees red over bad blood processing" (2011-03-18, China Daily, online English edition; retrieved on May 17, 2011). ↑ Moise Ngwa (2010-10-25). "formaldehyde testing" (PDF). Cedar Rapids Gazette. Retrieved 19 May 2012. ↑ "Was Death in the Milk?". The Indianapolis News. July 31, 1900. p. 5. Retrieved August 20, 2014 – via Newspapers.com. ↑ "Wants New Law Enacted. Food Inspector Farnsworth Would Have Use of Formaldehyde in Milk Stopped". The Topeka Daily Capital. August 30, 1903. p. 8. Retrieved August 20, 2014 – via Newspapers.com. "NIOSH Pocket Guide to Chemical Hazards #0293". National Institute for Occupational Safety and Health (NIOSH).